In 1955, African-American teenager Emmett Till of Chicago, Illinois, was visiting relatives in Money, Mississippi, when he reportedly flirted with a white woman in a small grocery store. Four days later, he was abducted, beaten and shot. His body was later discovered and retrieved from the Tallahatchie River. An all-white jury acquitted two white men of the murder. Till's death and open casket funeral galvanized the emerging Civil Rights Movement. 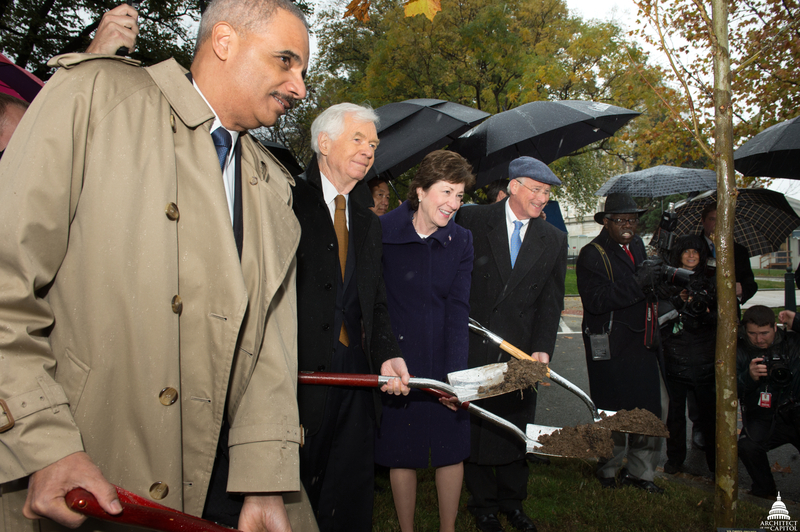 On a rainy day in 2014, an American sycamore tree was planted on the Capitol Grounds in memory of Emmett Till. Architect of the Capitol Stephen Ayers served as master of ceremonies. Those present at the tree planting included (pictured L to R) Attorney General Eric Holder, Jr., Senator Thad Cochran (R-Miss. ), Senator Susan Collins (R-Maine) and Senator Roger Wicker (R-Miss.). Also present were Eugene Robinson of the "Washington Post," Scott Pelley of CBS Evening News and Janet Langhart Cohen, author of the play "Anne and Emmett." During the tree planting ceremony, Senator Collins noted that, "the American sycamore that we dedicate to Emmett Till would have been familiar to him in the parks and tree-lined streets of Chicago." The signature ornamental feature of this huge tree is its brown bark which exfoliates in irregular pieces to reveal creamy white inner bark.